Have you ever had the experience of exploring the Mt. Hood National Forest under a blanket of snow? If you want to remain active through the winter and pick up a new hobby, you should consider learning how to snowshoe – just one of the offerings from our Recreation and Wellness programming this term. While snowshoeing, you can explore the winter wonderland while improving personal fitness. There is a bit you need to know before you go to get past the learning curve and to safely enjoy your experience. The following are a few basics of snowshoeing for beginners. Since you may be out snowshoeing for more than an hour at a time, it is important to have the right clothing, footwear and accessories for the conditions. Here are a few ideas to consider. You can keep warm while in wet and windy conditions by ensuring you are always wearing three layers while snowshoeing. For your base layer, choose a lightweight wool or synthetic fabric. Next, put on an insulating layer of fleece. Make sure your outer layer is made from breathable, yet waterproof, fabric. You should always wear a hat, gloves and sunglasses while mastering the basics of snowshoeing. To keep your head warm and dry, choose a hat made from thick wool or synthetic materials. You should also pick up two-layer gloves for snowshoeing, so you can choose between using the set together or glove liners alone, as needed. Since the snow reflects the sunlight, you may benefit from using sunscreen – and sunglasses with strong UV protection and a dark tint. Quality footwear can keep snow from dropping down into your shoes with each step. For the best snowshoeing experience, you should use high-quality waterproof, insulated boots. The boots should have durable rubber soles and protective elements across their design. To prevent blisters, always wear wool socks with liners when using your waterproof boots for snowshoeing. Depending on your intended snowshoeing activities, you have a choice between three unique types of snowshoes for flat, rolling and mountain terrain. The flat terrain snowshoes are best for beginners, as they allow you to traverse over lightly rolling terrain as well. The rolling terrain and mountain terrain snowshoes, however, allow for travel over steep hills and through icy conditions, making them a better choice for advanced snowshoeing enthusiasts. Beyond finding the right type of snowshoes, you must also ensure they can handle your bodyweight plus the weight of everything you are carrying. Check the recommended load rating on the snowshoes to ensure that they will support your full load and allow for easy travels across your preferred terrain. Also, make sure that your snowshoes have angled heel crampons for more intuitive downhill climbs. To keep you upright and moving forward as you learn how to snowshoe, you will also need to invest in a set of trekking poles that come with snow baskets. Consider equipping your snowshoes with quick strap-and-go bindings for easy setups before all your adventures. One you have all your gear ready to go, you can move forward in learning how to snowshoe. Snowshoes expand your footprint by design to keep you from falling through the surface of the snow. To accommodate the bigger footprint, you will need to learn how to slightly alter your gait to take wider steps. Practice on flat terrain at first to master the process of simply putting one foot in front of the other without stepping on the insides of the snowshoe frames. Going uphill and downhill takes a little more effort, however, as you will need to use the toe and instep crampons to retain your steady footing. While going uphill in powdery snow, you can use the toe crampon to create a small step with a kick of your foot. Hard-packed or ice-covered snow, however, will not likely have any give, often making it necessary to find a friendlier route. Downhill trips will take some getting used to as you will need to lean back into the tails to activate the angled heel crampons. Snowshoeing can feel a lot more demanding than it looks, so it makes sense to plan short adventures out at first. 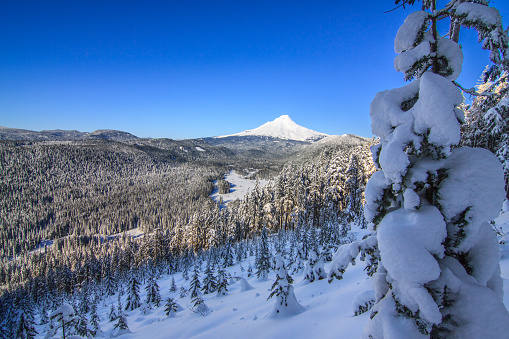 You can seek excellent snowshoeing conditions near Portland by simply setting your sights on Mt. Hood. You can find excellent beginner trails at Trillium Lake, Barlow Pass and White River Sno Park. When you learn and practice the basics of snowshoeing, you can explore the gorgeous Mt. Hood wilderness while getting in an effective workout. To get started in learning how to snowshoe, check out the snowshoeing course offered at PCC. Cost includes guide, snowshoe and transportation from Portland. Call 503-524-9192 for info.